I had a blast a week ago last Friday, climbing around the Carrie furnaces near Braddock, PA. The Carrie Furnaces are now an historic site. From the time they opened in 1884, they operated nearly 24/7 producing pig iron for Carnegie Steel from the raw materials of coke, iron ore and limestone poured down their cavernous throats. 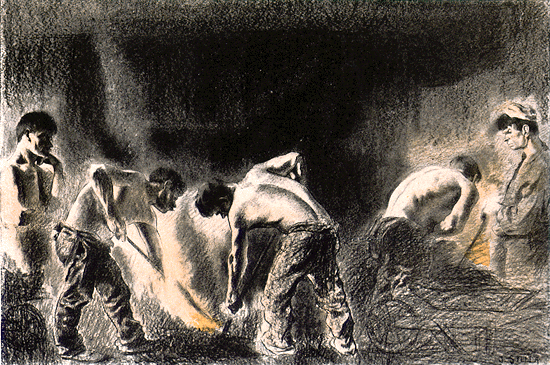 It’s hard to imagine the constant roar and +2000F-degree heat that workers encountered on their 12-hour shifts. Furnaces six and seven sit with the remains of the original structure quietly rusting now along to the Monongahela River. The asbestos, PCBs and heavy metals have been cleaned up. Sumac, Virginia creeper and poison ivy sprout among the buildings. I joined the artists from the Alloy Pittsburgh project scrambling above, around and beneath the hulking metal structure taking pictures and sharing ideas. Carl, a CMU MFA student originally from Texas, stood looking up at the tall stack that once spewed smoke over Braddock and across the river to Homestead. We bellied up to the beast while he shared the considerable information he had absorbed. I looked through an opening where the ore, coke, limestone and oxygen-laden hot air mixed in wild combustion contained by brick-lined steel walls. I looked down at the trench that carried the molten metal away to be put in rail cars also lined with brick so it wouldn’t melt through their steel bulkheads. 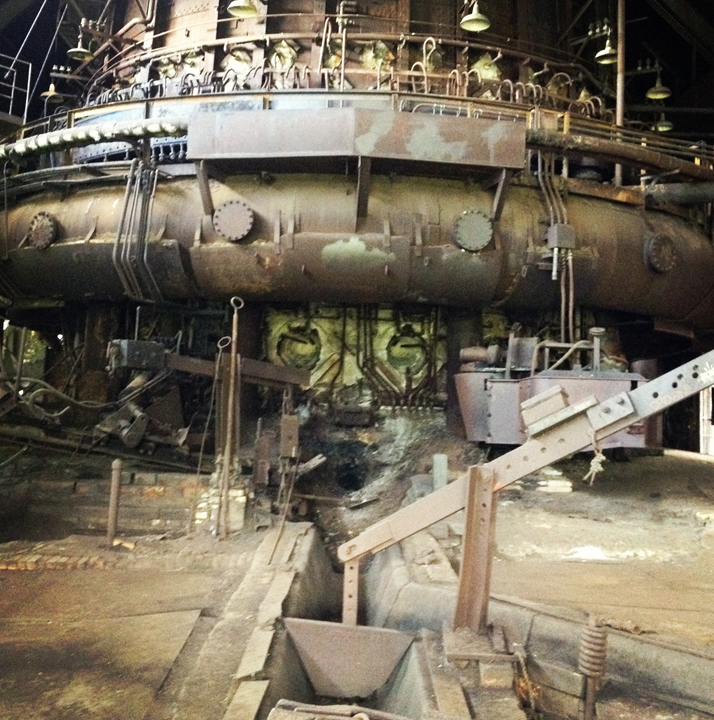 The goal of the project is to engage the artists in re-imagining the Carrie Furnace site. After spending a week in June attending lectures and events and touring the old mill, each artist will create their own original work to be exhibited in September. I presented one of the lectures Tuesday – sharing pictures and interpreting the stories of men who worked in the mill. I’ve never stood next to anything hotter than an outdoor gas grill or manufactured anything more than an excuse for being late to work. How do you re-imagine a place still haunted by the ghosts of the men who produced millions of tons of steel, went on strike, lived, died, worked and raised their families in nearby Braddock or Homestead? It’s easy to romanticize steel manufacturing in comparison to the ambiguities and dissatisfactions of so-called knowledge work. Mathew Crawford and Mike Rose point out that the distinction between work done with head and that done with the hands is often arbitrary. The expertise involved in makig steel (or other jobs in trades or manufacturing) is considerable. As both John Fitch and Margaret Byington’s interviews for the 1908 Pittsburgh Study reveal, workers in Homestead and Braddock took pride in taking raw materials and turning out a finished product — combining physical sense with practical skill and knowledge. Would most of us really want to be working in the mills rather than behind a computer? From the first labor-saving devices through the factory system of the Industrial Revolution and Ford’s assembly lines, efforts to automate work have focused on distancing the body from its dirty and dangerous aspects, as well as reducing (or eliminating) the problematic reliance on workers’ skill and motivation. As automation and deskilling invade virtual work of white collar professions and management, the unique expertise and value involved in labor done with the head are becoming more ambiguous. Management oversight and IT support are outsourced to contractors overseas. Voice recognition routes our calls for customer services. Algorithms programmed for pattern recognition read medical X-rays looking for signs of disease.